New Information About the Woodlawn Track Team & Practices: Harmful or Helpful to Adnan? Back in May, I did a post about Coach Sye ostensibly telling the defense private investigator that track practice started at 3:30 P.M. 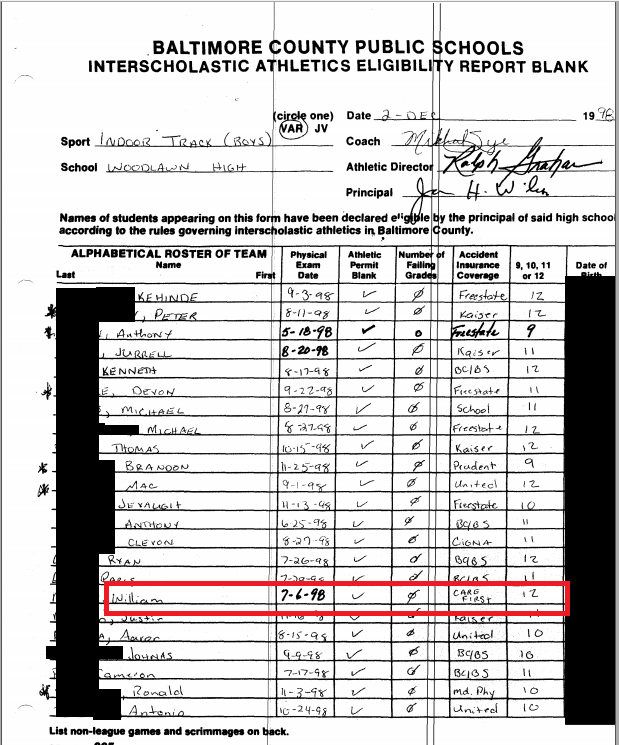 In that entry, I posted a memo with a track team roster from the defense files, which indicated that (1) there were eight members of the Woodlawn boy's indoor track team; and (2) there were two seniors on the Woodlawn indoor track team, with Will not being one of them. This roster came from Coach Sye himself, who provided copies to both the State and the defense. Coach Sye also told the police that he only had two seniors on his team. Now, based upon new documentation, it's possible that Coach Sye was incorrect on a couple of fronts. Here is a track team roster (View this photo) from December 2-4, 1998, which lists Will and several other track team members as seniors. 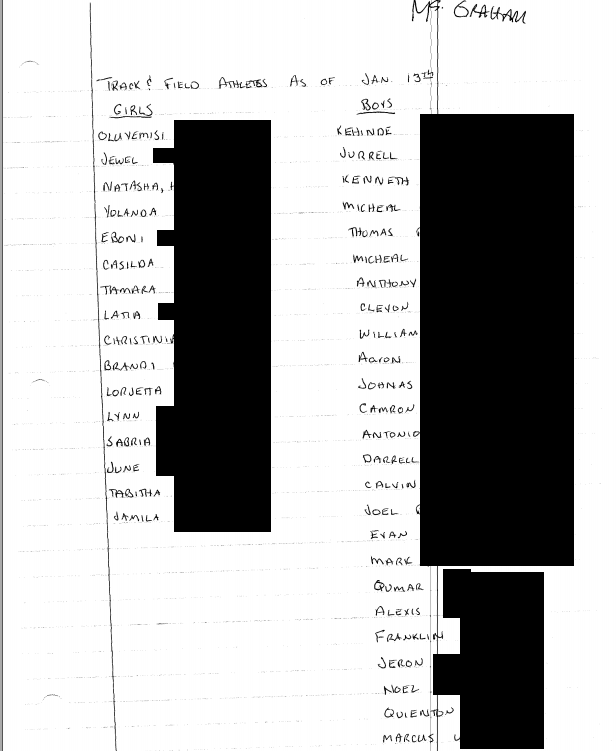 And here is a handwritten roster (View this photo) compiled by Coach Graham, which lists 25 boys and 16 girls as members of the track team as of January 13, 1999. If this information is correct, it tells us three things. First, it tells us that Coach Sye is not the best source of information for general information about the track team. This is important because a lot of people, myself included, put a solid amount of stock in Coach Sye's testimony in 2000 that track practice started at 4:00 P.M. back in 1999. Of course, a lot of people, myself included, also put a lot of stock in statements by other people that track practice started at 3:30 P.M. back in 1999. If, however, Coach Sye was far off on the number of seniors and runners that were on his team, his testimony about when track practice started is a lot less credible. Second, the defense dropped the ball on a number of potential alibi witnesses. The defense memo and other documents make clear that the defense team was only aware of the eight track teammates handed over by Coach Sye. If there were in fact 41 members of the track team on January 13, 1999, that leaves 33 teammates who might have had a recollection of Adnan being at track practice on that day who were never considered. Of course, that doesn't mean that the eight teammates listed by Coach Sye were really considered. As I've noted, Will,* who was on Sye's list, has indicated that he was never contacted by the defense. Third, if Coach Sye's list is incomplete, then Adnan's absence or tardiness would have been less conspicuous than if the track team only had 8 members...or maybe not. We've gotten information from a member of the Woodlawn track team in 1999. He isn't on Sye's roster, but he is on the track team roster from December 2-4, 1998, which kind of provides the answer to the question of the completeness of Sye's roster. According to this teammate, who wishes to remain anonymous at this time, (a) he thinks that practice had to have started at 3:30 P.M. back in 1999; and (2) Adnan was a sprinter who typically practiced with other sprinters, with the teammate recognizing 4-5 other names from the roster as the other sprinters. In other words, Woodlawn track practices were seemingly done similarly to the track practices at my high school, with the coach meeting with the different groups of track members at the start of practice and giving them their workouts for that day. For instance, I was a long distance runner, and the coach at my school would typically meet with us "LSDers" at the start of track practice to send us to do our fartleks or whatever workout we were doing that day. In that sense, Adnan might actually have been more conspicuous if he were absent or tardy. Sure, if the new information is correct, there were more track team members. But Adnan also would have been among a smaller group of sprinters who met with Coach Sye at the start of track practice to be given their marching orders. If he weren't there at the start of practice to get those orders, it seemingly would have been noticed. *If this new documentation is accurate, then Will was a senior in 1999 and thus not on the track team in 2000. Considering the prosecution and defense were neither accurate nor reliable investigators, I tend to believe that Coach Sye was referring to the small group of sprinters Adnan belonged to. Neither side bothered to actually investigate any testimony in this case. Had Coach Sye been asked to elaborate, maybe Adnan would never have gone to prison. Can you post Drew Davis' report on his 3/3 meeting with Coach Sye? That would probably clear up a lot of these issues. Kristin P: That could very well be the case. If so, the defense team’s failure to contact Will, who was on Coach Sye’s roster, is an even more egregious error. Seamus: As I’ve said before, I don’t have a record of Davis’s report. What I do have is Gutierrez’s notes based on what Davis ostensibly told/showed her. What am I missing, I don't see Adnan on the lists? Amy Cribbs...you needed to scroll down further to the Indoor Track team roster, his name is there. I agree with Kristin P. I think the coach was probably referring to the smaller group of sprinters. On the Dec 2-4, 98 list, Adnan is second from the end (last page). Two questions: isn't there a Woodlawn Yearbook from 1999 that would show the track team (sans Adnan)? And is it possible that Coach Sye was just listing the smaller group of team members that would typically practice with Adnan (e.g. just the sprinters) as opposed to the entire team? Cathy: That seems to be the case. If so, it makes the failure to interview Will so much worse. Bob: I don’t think the yearbook has the whole team roster. So, the coach's testimony about seeing Adnan cannot be trusted, if you take your new argument to its logical conclusion. I think that is a big problem for Adnan since there is no evidence that he was at the track at all that evening. S: As I said, there might be reason to doubt Coach Sye on general track matters. His recollection of seeing Adnan on a particular day is different. Jim M.: It doesn't look like the Woodlawn yearbook has that. I agree I trust Coach Sye re: the day in question because he remembered specific details about the weather and Adnan fasting. I do believe Adnan is probably innocent, but I also think it's a stretch to say that Coach Sye was wrong about the time track started just because he gave a smaller list of track athletes - especially if he was perhaps just giving a list of sprinters. Do you have any other reasons why you think he was wrong on the time of track starting? Other than others who said it started at 3:30, since I think similarly some others (Will?) said it started at 4. So many weird things about this case. Add to the list: Woodlawn High School 1999 yearbook has NO team photo of the track team with captions listing names of those pictured and those absent? Thought this was standard practice for public high schools. Though I didn't go to Woodlawn, I was in high school at roughly the same time (1997-2001). In my experience, fall and winter sports were always captured in the "right" yearbook, but spring sports were pushed to the next year. We were always told that it was because the yearbook printing deadlines were earlier than spring sports schedules, but who knows if that is indeed the case. So, I'm not sure if it was common practice or if it was simply due to some weird scheduling quirk at my school, but the Spring '99 track team would appear in the 2000 yearbook, not 1999.